How about a trunk - - - for your trunk? Since the Helix already has a capacious trunk, (Or are those saddlebags that open from the rear?) adding a top-box may seem superfluous; but I have my reasons. Assiduously watching eBay, I at last found this little trunk. 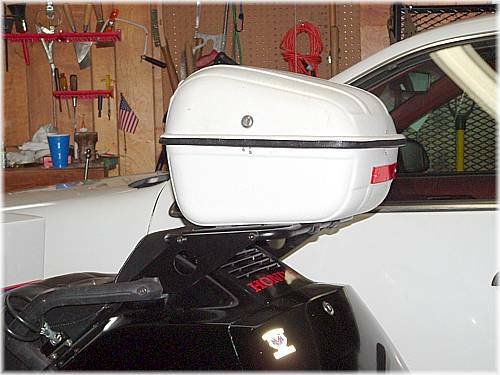 Then, late in 2007, a few extra $ became avilable, and I decided that I could afford a larger top box. ©2006 Bill Laudeman; all rights reserved. Page updated Wednesday, January 2, 2008 19:57 Eastern time.